The seventh century was a vital point in the history of the Byzantine army. Since the beginning of the century, territory in the Balkans had steadily been lost to Avars and Slavs. Byzantine forces had managed to avert the crisis of the Persian invasion in the East by finally achieving victory over the Sassanid Empire of Persia in 628 AD, but it was only a brief respite before the new danger, Islam, emerged from the Arabian Peninsula. Weakened by its recent costly war with Persia, the Byzantine army was defeated by Islamic forces and most of the empire fell to the Muslim conquerors. If Byzantium was to survive, it had to reevaluate its situation and devise a new strategy to combat the Muslims. This strategy was the creation of homegrown defensive units based in newly organized administrative and military provinces. The new defensive system created by the Byzantine army focused on the organization and advantages of what would become the ‘theme system’, the usage of Anatolian topography, and a new defensive style of warfare, saving Byzantium by creating a new bulwark against the Muslim onslaught. The Byzantine army may have lost an unprecedented amount of territory to foreign enemies, but through the creation of an effective defensive fighting force in the mid and late seventh century, they managed to preserve the Byzantine Empire. The Byzantine army under Heraclius (610-641 AD) had used the military strategy outlined in Emperor Maurice’s (582-602 AD) Strategikon, the seminal military treatise of the day, and allied Armenian and Khazar troops to successfully defeat the perilous threat of the Sassanid invasion in 628 AD, thus inaugurating a new era for Byzantium. However, there were many problems resulting from the Byzantine-Persian War. The situation in the Balkans and Italy had been steadily deteriorating since these regions were considered low priority except for Constantinople and were ignored in favor of the war with Persia, which was seen as a more pressing issue. After the economic and military toll of the war, there were too few finances available to retake or properly defend these regions in the Balkans, causing a major loss in Byzantine territory in Europe. The Middle Eastern territories that had recently been occupied by the Persian army, namely Palestine, Syria, and Egypt, had damaged infrastructure and a weakened economy. The loot captured in Persia only went so far in financing reconstruction in the Byzantine Middle East and changes had to be made to adjust to the situation. The army was expensive to maintain and was also a potentially dangerous element that could rebel, as it had done against Maurice. After the main Byzantine adversary, the Sassanid Empire was defeated, downsizing the army was seen as a tactical decision that would save money and would ensure internal security. However, an unexpected threat was soon to emerge out of the Arabian sands in the mid-630s. The Arabs, recently united under the religion of Islam , posed a serious threat to the weakened, militarily reduced Byzantium, which was still recovering from its recent war with Persia. Arab troops raided Jordan and Syria and in response Byzantine troops marched to combat the invaders. Unexpectedly, the decisive Battle of Yarmouk in 636 AD resulted in the annihilation of a major Byzantine army. This force had included many of Byzantium’s best troops and the Byzantine Empire, still recovering economically and militarily from the Byzantine-Persian War, did not have the ability to easily recruit replacements. This major defeat resulted in the Arab occupation of most of Syria and Palestine. The reduced Byzantine forces no longer had the resolve to fight another large pitched battle and the remaining troops moved north to fortify the passes leading into Anatolia, effectively demarcating a new barrier between the Arab Caliphate and the Byzantine Empire. In addition, the loss of the rich provinces of Syria and Palestine necessitated rethinking Byzantine military doctrine to create a viable alternative with fewer resources available. This was especially true after the Byzantines lost the rich province of Egypt in the 640s and the rest of Byzantine North Africa by 700 AD. With Heraclius’ death in 641 AD, it was left to his successors to lead the Byzantine army and combat the ever-growing Arab Caliphate. Byzantine recovery after the Battle of Yarmouk was possible through the gradual development of a new provincial and military organization system. The beginnings of the structure later dubbed the ‘theme system’ or 'themes’, occurred during the seventh century, although the Byzantines did not use the term thema itself until around 805 AD. This system involved the military and political reorganization of the old Roman provinces into new districts drawn upon military lines. Most scholars hypothesize that the retreating soldiers concentrated themselves in Anatolia to defend the remnants of the Byzantine Empire in the Middle East . 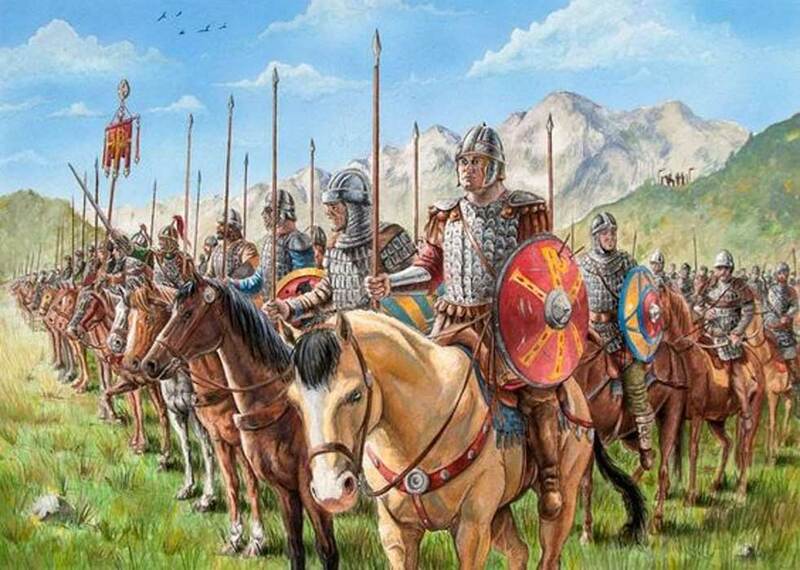 It is generally believed that the old field armies of early Byzantium were adapted into static armies settled in specific districts. This theory is grounded in the fact that many of the names of the newly organized districts that would become the first themes, relate closely to the names of many of the now defunct eastern Byzantine armies that had retreated into Anatolia. A few examples of this are the Army of the East (Anatole) transforming into the Anatolikon Theme and the Army of Armenia transforming into the Armeniakon Theme. While four of the new themes were established from old armies and were strictly invested as land forces, the Opsikion Theme provided a bodyguard for the emperor while the Karabisianoi Theme provided naval forces . The beginnings of a new organization system for the Byzantine military were underway. The thematic armies, those from the individual districts that were precursors to the themes, were not standing armies and were composed of locally drafted men. Locals were trained as soldiers, required to equip themselves for battle and stay on the land, where they could more readily defend their homes and communities. 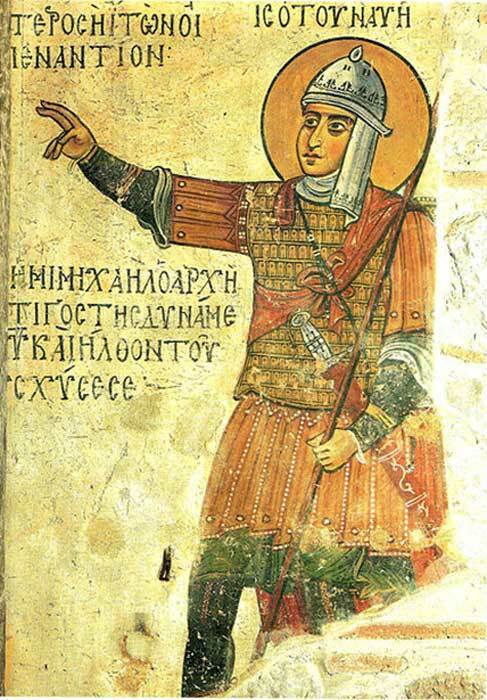 The Byzantines effectively established a state-run super militia that was organized on the local level but effectively incorporated as a part of the Byzantine military apparatus. Of particular importance was the cavalry from these districts, which was essential for countering highly mobile Arab raiding parties. An emperor could utilize thematic troops in a campaign by having himself or a surrogate travel along the military roads and pick up soldiers from each district in route to campaigning in the East. A strategos, or general, appointed by the emperor and who served at his pleasure, led each of the new themes. Unlike old provincial administration, both military and civil duties were now combined in the strategos alone, effectively putting the themes on military footing. To maintain the emperor’s influence, the money for each army was not directed by the strategos but by the protonotarios, an official appointed separately by the emperor who reported to fiscal officials in the Byzantine capital of Constantinople. In this new system, soldiers were relieved of taxes and supplementary taxes in exchange for providing military service for the emperor. They also held or were given land in the districts in whose thematic army they served. This gave them the earning potential to purchase the horse and weapons that they had to provide for their duty in serving in the thematic armies. This saved the Byzantine treasury critical funds by forcing the soldier to equip himself rather than finance state weapons factories, as they had in earlier centuries. In addition, it was also the duty of the thematic soldier to be trained in how to ride his horse and use his weapons. This provided native soldiers for the army who had a stake in the region they were defending. This native army was supplemented by external recruitment of fierce warrior peoples, such as the Khazars, but the Byzantine army was centered on a strong native core. The new Byzantine system of defense in the mid and late seventh century was chiefly centered on Anatolia in the East. The Byzantines faced large logistical challenges due to Anatolia’s topography that could hamper their military effectiveness. The tough terrain and long distances in Anatolia meant that it took armies some time to arrive on sight since they only moved about eight to ten miles per day. Byzantine armies used a variety of pack animals such as mules and dromedary camels to cart supplies. However, the long distance caused complications logistically in having enough pack animals available to haul supplies. In addition, the rough terrain of Anatolia could prove hard to traverse for many pack animals. They were also carrying sixty Roman pounds of equipment, which in Anatolia would be made harder by the hot sun, the rocky ground, the elevation, the dust, and the mud. Armies could also only carry about twenty days’ worth of food, making it necessary to acquire more resources on the move. Unlike during Roman times, Byzantine roads in their territories were far scarcer and were often little more than dirt tracks that were liable to become a muddy morass with rain. The mud of Anatolia also meant that oxen pulled carts would get stuck, rendering them fairly useless until the introduction of a movable axle sometime around the eleventh century. Oxen are fairly slow and will also give out on long distances, making them not very useful for marching a thousand miles across Anatolia. Camels are efficient pack animals since they can go long distances and are less likely to break their legs than oxen, but camels are not shod, and like horses, they cannot traverse sharp rocks or passes unless guided by humans. In addition, horses and camels cannot fight in these rough and rocky terrains that are common in Anatolia. These long, rough distances slowed down armies and made it difficult to adequately defend the long border of Byzantine Anatolia. The enemies of Byzantium naturally faced these same logistical problems in Anatolia, but they faced the added danger that they were on enemy soil. Adversaries were unlikely to be familiar with the terrain, and it would be more difficult for them to replenish their supplies because of their unfamiliarity with their surroundings, a lengthy supply line back to the Caliphate, and a hostile native population. They would also have to stretch their lines of communication and would be subject to attack by the Byzantine population throughout their expedition. These same logistical complications caused enemy sieges against cities in Anatolia to be difficult due to problems with transporting supplies, keeping lines of communication open, and procuring rations for soldiers. Byzantine army did not create linear defenses but instead utilized the natural topography of the Anatolian plateau and highlands to their advantage in defending this remaining eastern region of the Byzantine Empire. Anatolia has a much harsher climate than the warm Mediterranean weather of Syria and Egypt including regular natural disasters such as mudslides and earthquakes. Anatolia proper is only accessible from Syria through a series of mountain passes, which could be utilized effectively by just a few Byzantine guards since only a limited number of enemy troops could move through the narrow passes at the same time. Scouts were posted at and near the border to keep an eye on enemy movements and inform civilian and military populations of any potential incursions into Byzantine territory. It was advantageous to utilize the high ground commonly available in Anatolia in the form of mountains and hills for observation, which was important as a method of calculating speed, size, and movements of an enemy. The abundant Anatolian hills also provided a refuge for fleeing civilian populations and defensive armies, and carved caves were used for this same purpose in Cappadocia. Even with this advantage, Arab armies still vastly outnumbered local Byzantine defensive troops. Therefore, Arab armies that were raiding Anatolia were not attacked until they were returning to the Caliphate. Byzantine skirmishing strategy, as articulated by Nikephoros II Phokas (963-969 AD) and the general Nikephoros Ouranos in the tenth century, assumed a mountainous terrain with a variety of passes. These passes are perfect for trapping enemy soldiers. With enough troops, soldiers could attack from both sides of the pass to surround the enemy. Once the Arab soldiers were exhausted and weighed down with loot from their raid, Byzantine troops cut them off in the passes on their return, blocking both sides and surrounding and subduing the trapped Arab soldiers. However, this strategy had the drawback that the rural population suffered from the Arab raids, hurting productivity and the security of Byzantine subjects in the area. Eventually this led to much border territory being abandoned by the Byzantines as they fled inland or to the mountains. This created a no-man’s land between the Byzantine Empire and the Arab Caliphate that established the borders between the two states. This depopulated border region also assisted the Byzantines by better protecting the Byzantine populace and forcing the Arabs to create even longer supply lines into Byzantine territory. The new defense systems of the Byzantines were effective in protecting the vital core of the shrinking Byzantine Empire. The physical defenses that were created to supplement the natural barriers of Anatolian topography had been built from pieces of repurposed old Roman structures, known as spolia. Since Byzantium was now on the defensive, it was developing a different military organization than that used in Maurice’s seminal Strategikon. A warning and defense system was established against raiders so that the populace was notified and had time to hide themselves and their movable property from the Arab invaders. The most famous example of this was a series of fire signals stretching from the Taurus Mountains back to Constantinople that was supposedly established in the ninth century. In Anatolia, both sides established low budget, non-committal warfare. This for the most part did not involve standing armies or big pitched battles, the only exceptions being the campaigns directed by the Arab Caliphs themselves. One such example was the siege of Constantinople itself from 674 to 678 AD. Despite the superior numbers of the Arab army, Byzantine troops used a new and powerful weapon, Greek fire, coupled with successful defensive warfare to survive the attack. The Byzantine army had to have strong defensive capabilities if it was to survive, and the introduction of these new tactics helped Byzantium to endure the Arab juggernaut. Throughout the mid and late seventh century the Byzantine army was retreating, losing territory after territory to the Arab invasion. At the end of Justinian II’s (685-695 AD, 705-711 AD) first reign in 695 AD, Byzantine forces had lost Syria, Palestine, Egypt, Tripolitania, and parts of Armenia to the Arab Caliphate, and the last Byzantine outpost in North Africa would fall by the end of the century. In addition, the neglected European armies had also lost the majority of the Balkans to barbarian invaders while Italian territory was further diminished through military losses to the Lombards. Geographically, the Byzantine Empire was greatly reduced from what it had been in 600 AD, but the Byzantine army had been reconfigured to meet the new and pressing situation. The army was now more concentrated, as it had more limited territory to defend. The reorganization of Byzantine Anatolia, which would develop into the theme system, created a native military system where soldiers were settled in the new districts in exchange for providing military service. This not only created a military force which was far less expensive, since the soldiers paid for their own equipment, but also gave the soldiers a stake in the defense of their districts, since these regions were now also their homes. The seventh century was a time of evaluation and adjustment for the Byzantine military. In the end, a condensed, reorganized core remained that established a solid defense utilizing static native armies. Byzantium may have lost a significant portion of the empire, but its new military system laid the grounds for an effective defense against the Arab onslaught and the eventual gradual recovery of the Byzantine Empire. Dennis, George T., trans. Maurice’s Strategikon: Handbook of Byzantine Military Strategy . Philadelphia: University of Pennsylvania Press, 1984. Haldon, John. Byzantium in the Seventh Century: The Transformation of a Culture . New York: Cambridge University Press, 1990. Haldon, John. “Military Service, Military Lands.” In Dumbarton Oaks Papers 47 . 1-67. Washington, D.C.: Dumbarton Oaks, 1992. Haldon, John. Warfare, State, and Society in the Byzantine Empire, 565-1204 . London: University College Press, 1999. Kaegi, Walter E. Byzantium and the Early Islamic Conquests . New York: Cambridge University Press, 1995. Kaegi, Walter E. Heraclius: Emperor of Byzantium . Cambridge: Cambridge University Press, 2003. Kaegi, Walter E. “The Muslim Conquests of Edessa and Amida.” In Armenian Tigranakert/Diarbekir and Edessa/Urfa . Edited by Richard G. Hovannisian, 111-136. Costa Mesa, CA: Mazda Publishers, 2006. Mango, Cyril and Roger Scott, trans. The Chronicle of Theophanes Confessor: Byzantine and Near Eastern History, A.D. 284-813 . New York: Oxford University Press, 1997. Ostrogorsky, George. History of the Byzantine State . New Brunswick, NJ: Rutgers University Press, 1969. Treadgold, Warren. Byzantium and Its Army, 284-1081 . Stanford: Stanford University Press, 1995. Treadgold, Warren. A History of the Byzantine State and Society . Stanford: Stanford University Press, 1997. Ivan the Terrible: How Did He Become the First Tsar of Russia? Read more about Ivan the Terrible: How Did He Become the First Tsar of Russia?